Summertime. It hasn’t always been my favorite season if I’m being honest. I tend to overheat in the Arizona sun and I have to wear a wheel protector so I don’t melt on the asphalt. But the last few summers have been different. 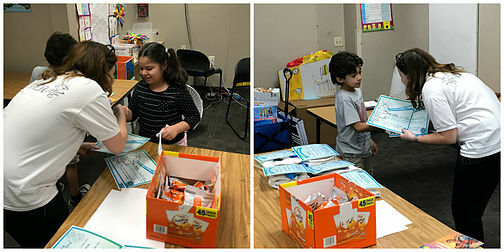 For the past three years, Valley of the Sun United Way has generously supported the expansion of our programs into the summer-learning arena, in partnership with the Boys & Girls Clubs of Metro Phoenix. And this summer, we were in two branches: The Tri-City West Thornwood Branch in Avondale and the Bob & Renee Parsons Branch in Phoenix. Normally, the RBBB program works with current third-grade students to improve their reading and comprehension skills throughout the year. But through our summertime program, we were able to work with second graders to give them a head start. And I’m happy to announce that, at the beginning of August, they marched into third grade as stronger, more confident readers. There are a lot of fun activities for kids at the Boys & Girls Club — and I’m proud that the RBBB curriculum has been added to the list. 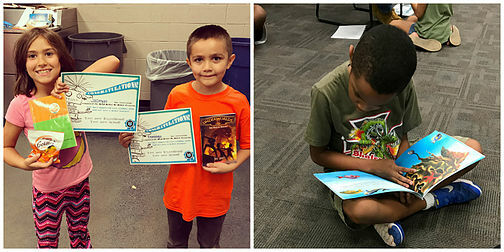 Our Littles spent their summers reading, learning, and preparing themselves for a successful school year ahead. And they even got a graduation ceremony to celebrate their accomplishments! I am always touched when humans choose to spend their time volunteering with us at RBBB. But it was especially capacitor-warming to see teens at both Boys & Girls Club branches happily volunteering to be Bigs. It was their summer vacation, after all. They could’ve chosen to spend their time doing something else but instead they wanted to help Littles learn to read better, be better — and that is BIG in my book! Thank you to our Bigs for volunteering their time, to our Littles for their dedication to learning, and to the Valley of the Sun United Way and the Boys & Girls Club of Metropolitan Phoenix for making this partnership possible. Summer Impact Data Is In! Robots love data — that’s a given. But this robot especially loves data that shows the profound impact our program has on our participants. I’m happy to report that the summer numbers are in and they’re pretty outstanding if I do say so myself. What a summer! I didn’t melt (perhaps only mildly) and we were able to reach more Littles during the summer months than ever before. That might be a wrap on our 2017 Boys & Girls Club of Metro Phoenix summer partnership, but we’re already looking forward to 2018! For now though, we’re focused on the fall school season and all the wonderful things we’ve got planned.